Brother In Ice is an exercise in trust—a risky venture, not unlike the expeditions into the blank canvas of the polar regions that Alicia Kopf traces in the early chapters of her ambitious hybrid novel. There is a distinct sense that the Catalan artist and writer is thinking out loud, mapping her own haphazard journey across the page. She could have lost her way, slipped into a crevasse and disappeared beneath the weight of her own icebound mission. But no. What she has produced, in the end, through an eclectic and inventive blend of autobiographical fiction, arctic-inspired scientific detours, and historical diversions, is a thoughtful meditation about identity, family, and the challenges of trying to explore one’s self through art. My brother is a man trapped in ice. He looks at us through it; he is there and he is not there. Or more precisely, there is a fissure inside him that periodically freezes over. When he is present, his outline is more clearly defined; other times he’s submerged for a while. He is interested in planes, trains, cars, cats, dogs and birds, inclined to watch them carefully and intently, but he is consistently unable to carry out ordinary tasks without being cued or asking what he should do. His presence, in what is ultimately a broken family, is significant. The scientific diversions continue into the second section, “Library Atop an Iceberg” but gradually the autobiographically toned fiction moves to center stage. After a rather defiant adolescence, complicated by negotiating the rough terrain between her divorced parents, the narrator makes her way to university where she persists in studying art and literature, worrying about the practicality of pursuing endeavours that are likely to be less than self-sustaining. She supports herself, first in retail and then with odd teaching jobs, has her first serious romance, and ultimately, her first art show. She travels, struggles to get along with her mother, and worries about what will become of her brother and her responsibility for him as he ages. The chapters, if you can call them that, are short, vignettes and reflections, played out against glacial motifs. Finally, in the third section, she visits Iceland. I often find myself getting stuck in this project. I see nothing before me, just white. Yet beneath there are many things. The shrieking of seals. Was it the poles I wanted to talk about? Or is it just the image of the snow that fascinates me? Instability, confusion, cold (it’s hot), determination. Sensations that were the constant companions of the polar explorers, as well as those of us who work with the blank white page. Because I’m not interested in the polar explorers in and of themselves, but rather in the idea of investigation, of seeking out something in an unstable space. I’d like to talk about all of that as a metaphor, because what interests me is the possibility of an epic, a new epic, without foes or enemies; an epic involving oneself and an idea. Like the epic that artists and writers undertake. Hers is a journey that resonated deeply with me. Especially as a writer working in the uneasy territory of memoir, I loved the openness, the questioning, the self-doubt Kopf allows her narrator (and presumably herself) as this odd creation takes shape. As her own questions and explanations start to come into focus, the layers of inspiration that preceded her quest, finally start to make sense. The beauty of this book is not simply that it is an intriguing and original account of one woman’s coming to terms with some of the unresolved fractures in her own history, it is a challenge to other explorers who venture forth with pen or paintbrush in hand to forge their own paths as they seek to tell their stories. 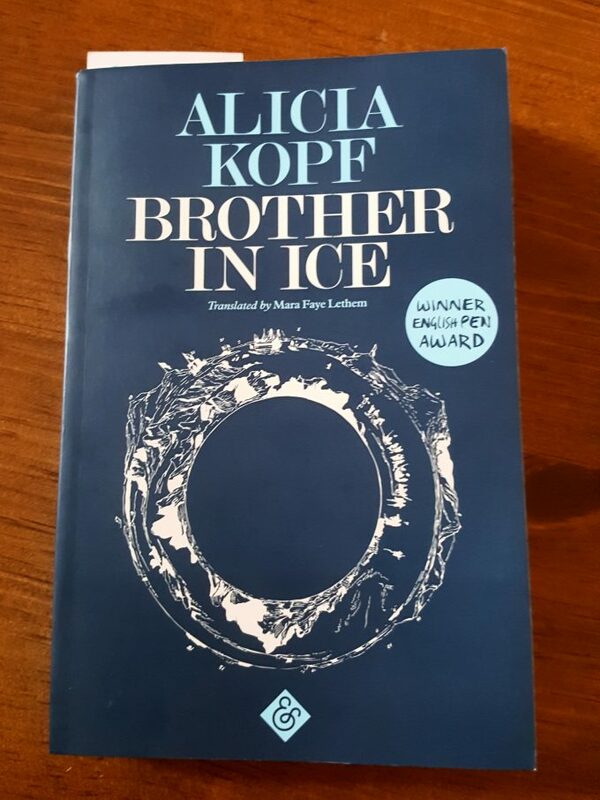 Brother In Ice by Alicia Kopf is translated from Catalan by Mara Faye Lethem, and published by And Other Stories. My latest review for Numéro Cinq is now live. When I read for these reviews, the question that guides me is “What is interesting about what the author is doing (or trying to do) in this book?” I am listening to the language, paying attention to the structure, the voice, the tone, and asking what makes this work come together? What sets it apart? I am reading as a writer–an intuitive writer–unaided and yet unburdened by a formal education in literary theory. 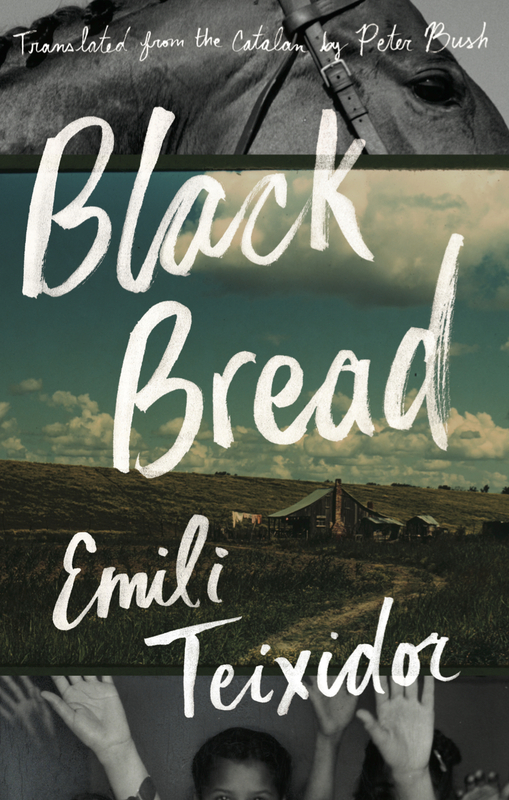 Coming of age themed novels such as Black Bread by Catalan writer Emili Teixidor present a particular challenge. When a first person narrator is recounting events and experiences from his or her own childhood, my attention is focused heavily on narrative voice. I am always trying to determine where the narrator is standing in time relative to the story being told. I had the sense with Black Bread that the protagonist Andreu was writing from his later teens–just far enough away to have some perspective on the limitations of his understanding of the precarious realities around him, but close enough to recreate the innocence and naivete of childhood. It works, but the more absorbing, and I suppose the more effective the voice, the more difficult it is to describe how and why it works. There is an interlude, just shy of a third of the way into Black Bread by the late Catalan writer Emili Teixidor, where the narrator steps back from his childhood reminisces to question the nature of memory. He asks why some things stay etched on his memory while he has forgotten others completely, and wonders, “how can I know I have forgotten what I can’t remember?” He recognizes that some places, people and incidents fade quickly whereas sometimes a word can come back unexpectedly and ignite a flood of distant memories. These reflections appear as a curious break in a narrative marked by a degree of youthful naiveté, but remind us that the journey from childlike to mature understanding is uneven and necessarily distorted in retrospect. So, although it is never entirely clear just how far removed the protagonist stands from the experiences he is sharing, as his account continues his ability to hold on to his own innocence will increasingly come into conflict with the harsh realities of life in post-war rural Catalonia. In recent years, much revisionist debate has been dedicated to exhuming questions of the true impact of the civil war and the Franco dictatorship on Catalan culture and society; “true”, that is, depending on where one’s interests lie. Against this backdrop, a novel like Black Bread, originally published in 2003 when Teixidor was seventy years-old, could easily be construed as an attempt to reclaim history through lived memory. That may, in part, be a fair assessment, but this novel offers much more. It is, on one level, a tender and sensitive coming of age story, one that filters the joys, fears, mysteries, and discoveries of the fitful transition to adolescence through the unaffected lens of childhood memory. Our narrator, Andreu, an astute observer of his own confused emotions, must learn to navigate a world filled with dark dangers and even darker delights. He knows there is much going on around him that he doesn’t understand—truths that he isn’t certain he even wants to understand. However, his growing awareness and conflicted reactions open space for an indirect but honest commentary on the realities of Catalan existence during this time. In this respect, the work can be seen in line with that of writers like Josep Pla and Mercè Rodoreda. Fresh air streamed in through the window. When the dining-room clock struck three, I rose and left without even washing my face and, you might say, with only the clothes on my back. I had taken some fifty steps when something made me turn around and glance back at the house. The moonlight fell full on it. My father stood at the door watching me, holding me–still a little boy–in his arms. It was the first night that I roamed alone through streets outside my neighbourhood. I ran. Goodbye carnations, adéu! With this ghostly image of his deceased father holding his infant self, Adirà Guinart, the fifteen year-old narrator of Mercè Rodoreda’s poignant novel War, So Much War, turns his back on a fractious relationship with his mother and a life growing and selling carnations. He is seeking a life of adventure. Yet, as one must be careful what one wishes for, he is about embark on a journey that will leave him irrevocably changed, and sadly and wistfully mature for his age. Although the place and conflict is never explicitly named, it is assumed that the setting is Catalonia, the author’s homeland, during the Spanish Civil War. But in truth the exact details do not matter, this is a novel about the wide sweep of war beyond the front lines, about the damage, destruction and despair that works its way into the landscape, the villages and the lives of the people who are often hard pressed to explain who or why they are fighting. Yet, the bleakness is, in Rodoreda’s hands, filtered through a surrealist lens that renders it at once engaging, wise and profoundly sad. Idealistic and bored, our young protagonist leaves home to join the war effort, but he is quickly disillusioned with the soldier’s life, and runs away again, falling into a life that suits his temperament, that of the wanderer. Unfolding over the course of a series of short episodic adventures he encounters an array of tragic comic characters–the bereaved, the abandoned and the eccentric–who share their wisdom, offer him lodging or seek his assistance. Classic folkloric elements are present, including a strange castle, an enigmatic young woman, an ugly old hag, a hermit with a tale of hard earned humility and a mysterious benefactor with a haunted mirror. But War, So Much War is more than an allegory or a fairy tale, there is something profoundly serious and unsettling beneath the surface. The narrative, unadorned and seductive in tone, fuses sensuous evocations of natural beauty with brutal images of suffering and death. The ground is worked to plant crops in one place, only to be dug to bury piles of corpses in another. Our hero approaches each task without question, claiming resistance to the more tangible horrors of death; fearing instead the unseen, phantasmagorical horrors that pursue him. But is there really a difference? In his world, reality blends with dreams, and the narrator treads a ground that gives away to as readily to natural beauty as to nightmare. Even in romance, that line is readily crossed. Early on, Adirà falls in love with Eva, a free-spirited young woman. He is drawn to her most critically because she refuses to be held and restrained by anyone. As much as he admires that aspect of her character, a quality he also claims for himself, he begins to long for her as his journey moves, at least in spirit, toward home. Her ultimate fate is perhaps the most melodramatic, yet deeply tragic element of the entire tale. My life is my own . . . A few months ago, I don’t know how many, I still had a pocket knife with a fork, spoon, corkscrew, and screwdriver that my father had given me, but I gave it away. And now the only thing I have is my own life. If I speak about it, it escapes, I lose it. He gave me a pat on the back, almost laughing as he did so. I know , I added, that all lives are more or less the same in the essentials. He thrust his head back and closed his eyes, leaving just a slit open to spy on whatever it was he wanted to see. Don’t make me laugh. What will you do, restlessly drifting from place to place? Do you want to end up sleeping on the street or in a church portico when you are an old man? I don’t care. I want to roam the world. Be from everywhere and nowhere. For all its sadness, there is much wisdom in these pages. Rodoreda’s smooth, clean prose with its seamless flow between speakers without breaks or quotation marks, adds to the dreamlike, reflective feel of the narrative. For all the fairy tale elements that feature in Adirà’s wandering, the underlying current of his journey is marked by despair and hope. This is a novel that is not only timeless but, sadly, still very relevant today. Mercè Rodoreda was born in Catalonia in 1908. Her native language, Catalan, was banned under Franco’s dictatorship, but she continued to write in the language throughout her career, even while living in exile following the Spanish Civil War. Today Catalan is spoken by only about nine million people and translations are critical to help keep the literature alive. Originally published in 1980, War, So Much War is translated by Maruxa Relaño and Martha Tennent, and published by Open Letter. 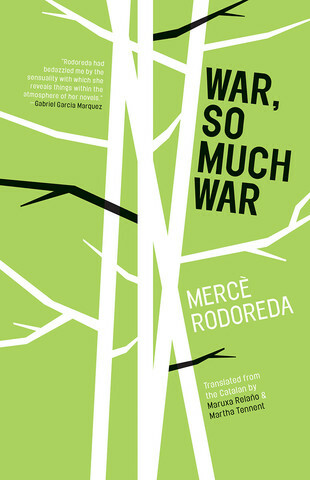 * War, So Much War has been shortlisted for the 2016 Best Translated Book Award.